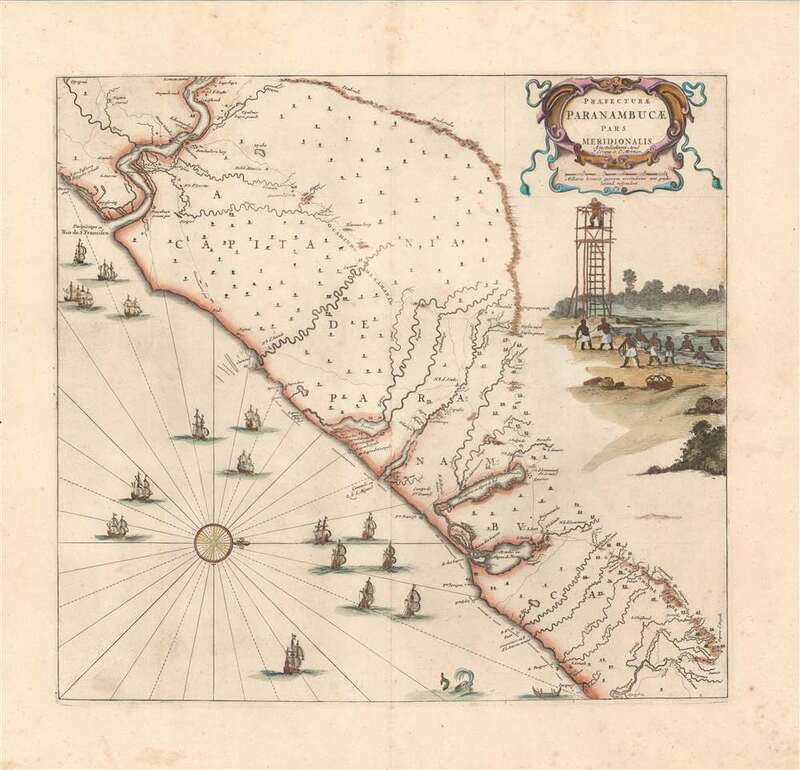 Important and scarce map of Brazil, considered one of the finest maps of Brazil ever produced. This is a scarce c.1721 Covens and Mortier edition of the map of the southeastern coast of Brazil. Oriented with north to the right, it covers the interior from around the Sao Paulo region south along the coast of Brazil from Rio Gujaraigacu to Rio de San Francisco. Earlier maps of the region were drawn from information based on Portuguese research. This important map is the first to focus on Dutch rather than Portuguese interests. The map is superbly detailed, with topography beautifully rendered. In the Atlantic we can see several sailing ships, a sea monster and a boat. A decorative title cartouche appears in the top right quadrant. Below the title appears an illustration based on the design by Frans Post. It features a fishing scene with a lookout tower with people below pulling in a net. This map is based on the original map by Georg Marcgraf, cartographer to Count Johan Maurits who was the Governor General of Brazil for the Dutch West India Company from 1637 to 1644. Maurits account on the climate, religion, language, inhabitants, flora and fauna of coastal Brazil was issued in Casper Barlaeus’ Rerum per octennium in Brasilia, first published by Bleau in 1647. Bleau later included this map in his Atlas Maior in 1662. This is the Covens and Mortier edition of the Bleau map. Very good. Minor wear along original centerfold. Minor spotting. Original platemark visible.